Bring your PS Home avatar to a firefight, because nothing says "let's hang out" quite like a shotgun blast to the face. 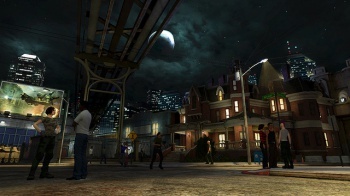 As you're probably aware, big changes are coming to PlayStation Home. Sony is gearing up its hub to become a virtual socializing and gaming spot, and it's decided that a great way to facilitate friendship between online gamers is to let them murder each other with guns. Bootleggers is a free-to-play first-person shooter that players will be able to access via Home's "Action" hub, where their avatars will meet, greet, and blow each other away. The game supposedly lacks the depth of a modern online FPS, but makes up for it by being totally free and easy to jump into. "It's not freemium," said Jack Buser, the director of PlayStation Home. Anyone with a Home account will be able to jump into a multiplayer lobby, without waiting on a virtual line. There's no word yet on why Sony chose the Bootleggers title, but given the dark and sketchy art design behind the Action hub, the name fits with its gritty, urban atmosphere. The Action hub will be just one of many, and Buser has also discussed a poker game for the Sports area. While not quite as unusual as an avatar-driven FPS, players competing in poker matches will be able to watch real-life sports highlights in the background, giving the hub the feel of a real-life hangout. These two games, along with a whole new slew of features, are set to debut for Home later this year. Will we see a context-based meta-story for Bootleggers in the vein of Team Fortress 2? Maybe not, but it's not too early to hope.